The 2019 NFL Draft will be here before we know it but before then, the NFL’s free agency period will open up, and teams will be looking to bolster their lineups with new signees while also looking to keep on board players who have shined bright since their arrival with their franchise. One big thing for the 2019 free agency period is that, for the first time, a rookie class that we had at least a college year of data from, have all now either finished their rookie contract or those select first rounders have had their final year exercised to stay with their team. 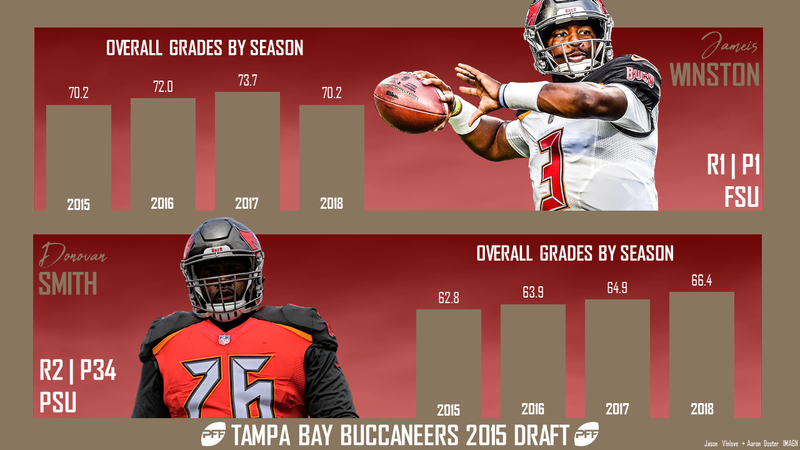 With that in mind, we decided to take a look back at some grades and PFF advanced statistics and data for every team’s first- and second-round pick since that 2015 season. While some of these players are no longer with their respective team, the players listed below were all drafted by the team mentioned and the grades and stats represented are just from their time with their drafted team. Today’s series takes a look at the NFC South. Beasley has been a mainstay on the Falcons defense since he was drafted, logging at least 535 snaps in every year since. Unfortunately for him, and Falcons fans, current year sack totals are not predictive to future year sack totals and he never quite has lived up to his career-year in 2016 as he’s put forth season grades of just 59.1 and 42.2 in 2017 and 2018, respectively, while decreasing his total QB pressure total in each year since 2016. This year will be a make-or-break year for the former first-rounder. Well, Collins’ career hasn’t exactly panned out like many would have hoped, but more like the way many thought it would. Following a 10-game suspension in 2017, he was waived by the Falcons and subsequently signed by the Colts, but hasn’t played a snap of meaningful football since he allowed two touchdowns to the Patriots in Super Bowl LI. 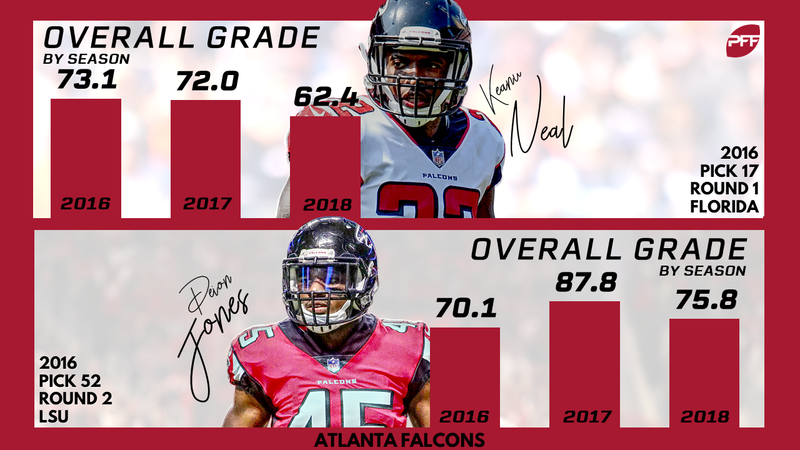 The loss of Neal in 2018 pretty much did the Falcons in last season as he had finished both his seasons as a pro with grades at 72.0 or higher and seemed well on his way to doing so again in 2018. Still, with a year off and only 23 years old, Neal has played 2,347 career snaps and has the experience of a much older player. His return will aid the Falcons immensely in 2019. Much like Neal, Jones’ injury greatly hurt the Falcons’ hopes of returning to the playoffs a season ago. He was limited to just 384 snaps and six games after logging at least 1,110 snaps in each of his first two seasons. Still, he graded out at a very respectable 75.8 overall and continued his dominance in coverage at the position. McKinley may have recorded eight sacks this season, but it took him 410 pass-rushes to do so, shaving over 6.0 grade points off his overall grade in Year 2. Still, he’s a formidable player when rushing the passer, and if he could limit the missed tackles (six career on just 40 total tackle attempts), a place among the top tier edge defenders is possible. 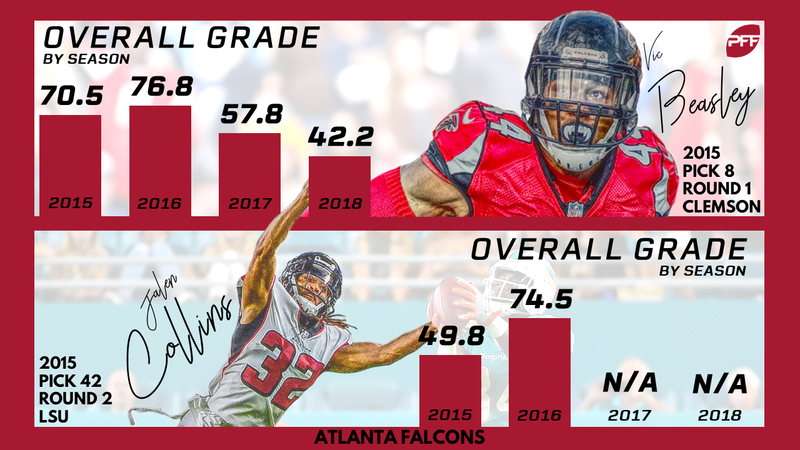 The only offensive player drafted by the Falcons in the first or second round since 2015, Ridley was impressive in his rookie season. He was the eighth highest-graded player on offense for Atlanta this year, hauling in 64 receptions for 821 yards, 10 touchdowns, and an additional 28 first downs. If he can string back-to-back performances as he did in the early stages of last season, he becomes a top-25 WR in no time. Oliver flashed at times in his rookie season, most notably down the stretch and against division foes. Against Carolina in Week 16, he put forth his career-high game grade at 88.7, securing his first interception. With some more time in and a little more seasoning, Oliver has all the tools to be special. Thompson has put forth career season grades over 68.0 in all but one year to date and played at least 441 snaps in each of his four seasons. He’s added more to his pass-rushing skillset over the past two seasons with the Panthers, accumulating 14 pressures in 2017 and 13 in 2018 to round out his game. Funchess has struggled with drops for his entire career and this past season was no exception. He now has dropped 23 of the 193 catchable passes thrown his way over the past four seasons. Still, when he does get his hands on the ball, he’s typically moving the chains as he’s hauled in a first down or a touchdown on over 75.0% of his career receptions. Butler hasn’t quite lived up to the hype of a first-round prospect from a small school but has still produced solid seasons on a more limited snap count while flashing some potential at times. His career year in 2017 saw him bring home 16 QB pressures on just 198 pass-rush attempts while not missing a single tackle. Bradberry capped his 2018 season with 13 pass breakups but allowed six touchdowns in his primary coverage. His 64.9 coverage grade this past season is still an improvement from his 2017 year, but overall neither his coverage nor his overall grade has reached the levels that he put forth in his rookie year since. Talk about a breakout year, as the former Stanford great and Heisman Trophy finalist took over as the bellcow in Carolina, logging the third-most snaps in the NFL at the position. He did so with relative ease at times it seemed, playing at least 57 snaps in every game but the season finale when the season was all but over. In two years, he now has 194 receptions, 1,626 yards and 12 touchdowns in the passing game alone. While it was a down year for the Panthers, Samuel had himself quite the season in 2018. He put forth three single-game grades well above the ‘good’ qualification and finished the season with 11 total missed tackles forced (9 on receptions, 2 on carries). This was all done after a sluggish first season in which he forced just four total missed tackles and had an overall grade of 56.9. He’s trending in the right direction heading into Year 3. The second highest-graded player on offense for the Panthers this past season, Moton struggled in Week 1 at left tackle before a position shift to right tackle did him well. For the season, he allowed just two sacks and one QB hit en route to an admirable 82.7 pass-blocking grade. After logging 70 snaps during his rookie season, it’s a safe bet to say that more play like what we saw in 2018, Moton becomes a fixture on the Carolina offensive line and a shoo-in for a big contract when his rookie deal is up. 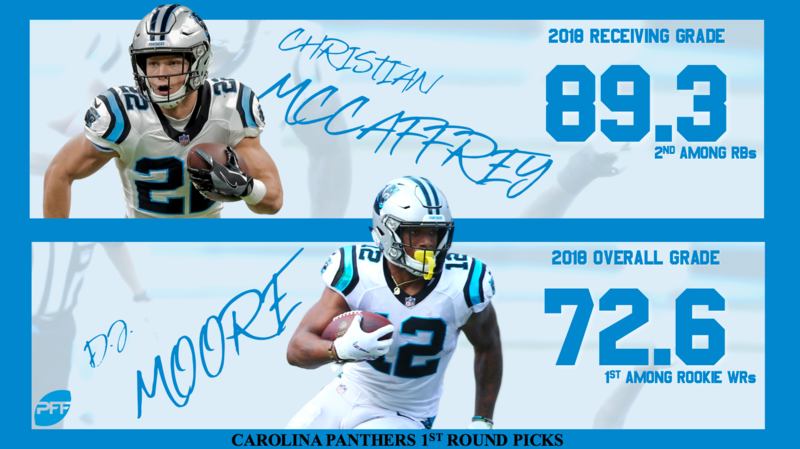 Moore led all rookie receivers in overall grade, receiving grade and missed tackles forced after the catch as he was absolutely dominant in the Panthers offensive scheme. In fact, his 17 missed tackles forced this year were second to only Odell Beckham Jr.
It’s no question that the Panthers struggled in coverage in 2018 and Jackson was no different. His rookie year saw him targeted 73 times and he allowed 52 receptions for 675 yards with three touchdowns. Perhaps the most alarming statistic from his debut season was the volume of missed tackles, as he whiffed on 15 of his 92 total tackle attempts. It’s a safe assumption to say that Peat struggled in 2018. He put forth only three single-game grades above 60.0 and capped his season-high game grade at just 63.7. When factoring in the postseason, his 39.2 overall grade saw him finish dead last among 86 guards who played at least 20% of their team’s snaps. Still, the Saints have to hope that this was just a blip on the radar for him as Peat hadn’t graded lower than 67.1 in his first three seasons. Anthony’s two-year stint with the Saints saw him miss a whopping 16 of his total 135 tackle attempts and give up seven touchdowns in coverage. Since then, he’s logged just 158 snaps in two seasons with the Dolphins. 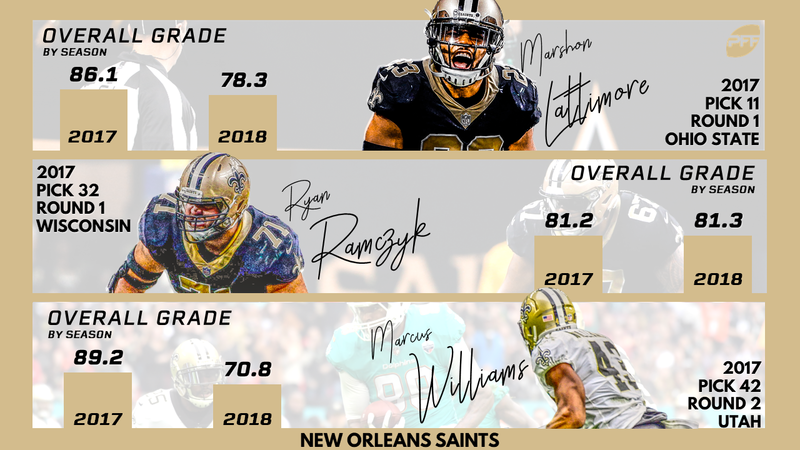 Kikaha has played just 826 snaps in his career since 2015, adding little value, however, in his time with the Saints. He did rack up 26 total QB pressures as a rookie in 2015 but also missed six tackles and gave up a catch rate of 92.9% on 14 targeted passes in coverage. Rankins has rounded into form after two slow years, grading out with career highs in overall grade, pass rushing, and run defense. He racked up 46 total QB pressures this past season, four short of his career-high, but did so on 148 less pass-rush attempts in 2018. 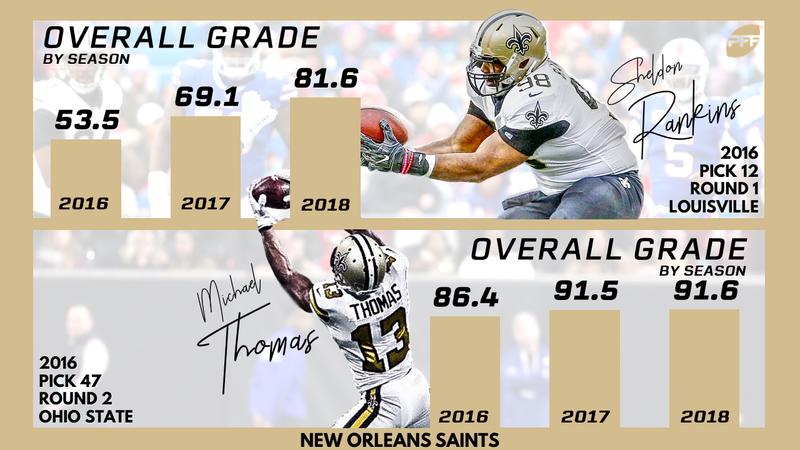 How Thomas slipped to the second round is still beyond some as he’s put forth now back-to-back seasons of elite grades, even pushing past his 91.5 overall grade in 2017 with a 91.6 overall in 2018 when factoring in the playoffs. A threat to catch any ball thrown his way as well as a threat to make you miss after the catch, Thomas has now forced at least 17 missed tackles in all three of his seasons and racked up a career 1,567 yards after the catch. His All-Pro caliber season of 2017 was nothing short of miraculous as he allowed just 53.8% of passes thrown his way to be caught, kept receivers out of the end zone and made five interceptions and 13 pass breakups in his debut season. While 2018 was not up to that high standard, it was still nothing to scoff at as he once again limited receivers to just a 64.3% catch rate and made another 10 plays on the ball (4 INT, 6 PBU). Ramcyzk is a mauler up front and one of, if not the league’s best when it comes to run blocking. He now has put forth overall grades, run-blocking and pass-blocking grades above 76.7 in both of his professional seasons and is becoming the gold standard at right tackle. Forever etched in NFL postseason folklore, Williams’ missed tackle against Minnesota lost the game for the Saints, but he still had an impressive debut year. While he struggled in Year 2 in coverage, he still has brought home seven career interceptions and limited quarterbacks to just a 58.8% completion percentage into his primary coverage. The Saints traded away what seemed like a lot of draft capital to move up to select Davenport last April, and while he didn’t quite have the sack totals one may have expected, he still registered 30 QB pressures on just 296 pass-rushes. He limited mistakes and even had a stretch of four straight games with multiple pressures during the middle of his debut season. The year is 2019, and we still don’t know if Jameis Winston is the long-term solution for the Bucs at quarterback. He’s just 25 years old at this point and staring down either a massive contract extension with the Bucs or testing the free agency waters next offseason. One thing is certain, at times Winston has shown he is capable of being mentioned in the top signal-caller discussion with his 85 big-time throws, while he has also shown his tendency to force throws, which has led to 86 turnover-worthy plays, the latter figure ranking second-most since 2015. Smith is on the heels of his highest-graded season to date as he enters free agency. His time in Tampa appears to have run its course as he finishes his tenure with the Bucs having allowed 202 career pressures on his 2,828 pass-blocking snaps. His durability will likely get him signed elsewhere, and for big money in a left-tackle depleted landscape. Marpet is a stalwart along the Bucs offensive line, and after having spent a year away at center, he has come back to the position in which he put forth his career-high grade in. He’s no slouch with his run blocking but has shined in pass protection, allowing just 97 pressures over his career spanning 2,445 pass-blocking snaps. 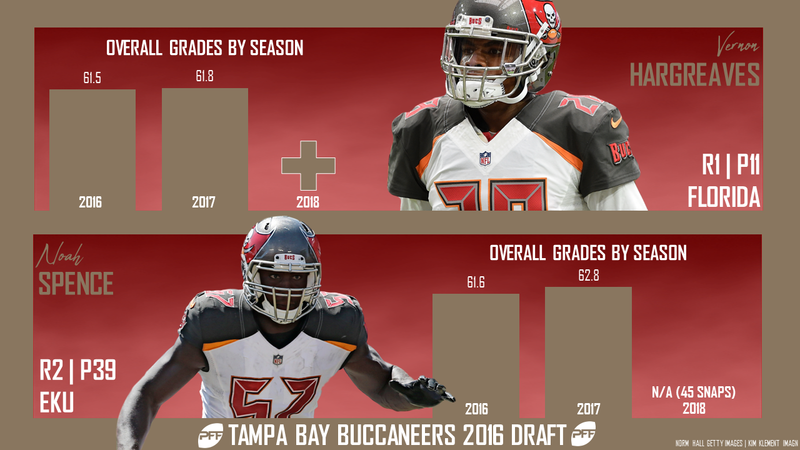 It remains to be seen what type of Hargreaves that Bucs fans will get to see as he was limited to just 53 snaps a year ago. He shined in the slot during his second season but still has given up four touchdowns compared to just one interception and missed 22 of his total 147 tackle attempts in his young career. Spence bounced from Ohio State to Eastern Kentucky and landed on the Bucs as a potential pass-rushing threat, and he flashed that during his rookie season with 40 QB pressures. He has been able to muster just 13 since. You’ve known this by now, but it must be said again: Aguayo was an abomination with the Bucs. He made just 71.0% of his field goal attempts including making just 4-of-11 from 40 yards or more. He missed two extra points in his one-year stint with Tampa and has signed and been waived by the Bears, Panthers, and Chargers since. A prime candidate to bounce back after a disappointing rookie season, Howard more than impressed this past year. Before injury shut him down after Week 11, Howard had hauled in 72.3% of his targeted passes and put forth plus-grades in both pass protection and run blocking. He’s primed and ready to be a top tight end in the league for years to come. Evans was actually the Bucs’ fifth highest-graded player on defense this past season, shining in Year 2 as he limited the mistakes he was prone to during his rookie season. After allowing 17.7 yards per reception in 2016, he shortened that to just 11.8 in 2018 while limiting receivers to only 51 yards after the catch last year. Vea came on strong down the stretch, landing a spot on our All-Rookie team in the process. He racked up 26 QB pressures on just 233 pass-rushes and was a force in run defense, which we knew already. If he can continue to increase his pass-rushing skillset, the sky is the limit for the former Washington Husky. You may not have known it, but Jones played in eight games this season and ran the ball 23 times. He hardly made a splash, however, as his season-long carry was just 9 yards. It remains to be seen what new head coach Bruce Arians’ plan for the former USC running back moving forward. Stewart struggled in coverage during his first professional season, and there is no way around that. He allowed 34 of the 40 targeted passes thrown his way to be caught for a whopping 407 yards, 206 of which came after the catch. He allowed five touchdowns without making a single interception and saw a passer rating of 148.6 when targeted. That will have to improve. Not much better than his rookie counterpart, Davis also allowed a heavy catch rate and four touchdowns without making an interception. His grade was helped overall by the fact that he added value in run defense, not necessarily something you’d want to lean on as a defensive back in today’s NFL.